I love his observations on what happens when you try to teach programming to kids. I’m sure there’s some six year old somewhere who has already made a million dollars selling an iPhone game that they programmed themselves. But to be honest, my kids haven’t started writing any programs of their own. In fact, I’m not even sure they’re interested in programming! But my son Cy has gotten obsessed with math concepts like factorial because of this little exercise and more importantly he’s seen that programming is something that anyone can do! There are several lessons, I can draw from this about teaching programming to kids. We really don’t want every one to be a programmer (unless they want to). But, we certainly want to show them the joy of creating. IMO, programming is another one of those really good thinking tools. If you are going to be at NPC 2013, we would love to have you at the un-conference session. It is on 29th (11:30-12:30). We normally pick a few topics and request people to vote for their favorites. As of 5pm on 27th, it looks like this. We will freeze it in 24 hours. You have a chance to influence it. 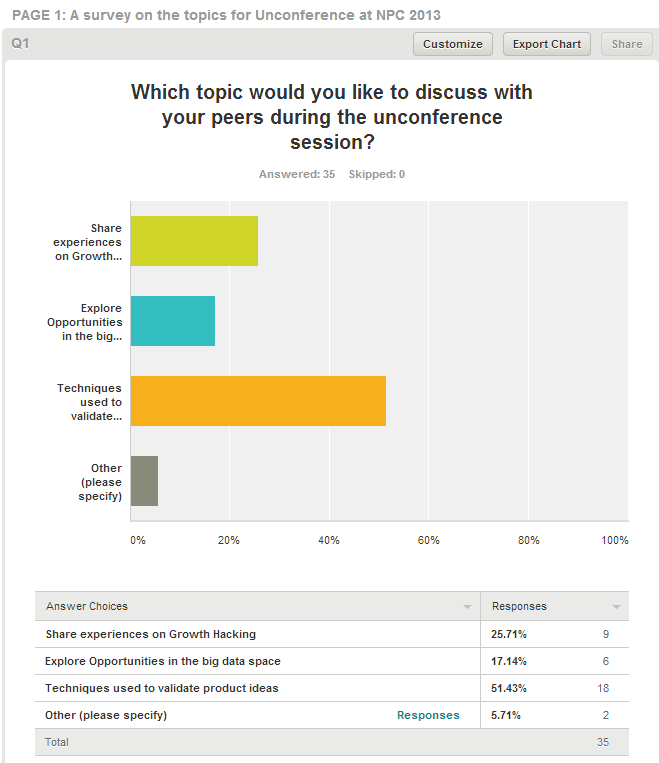 If you are planning to attend the un-conference session please do vote for your topic. Whatever you do, do not read this book! It is a hands-on guide to building web applications in Python Django, reading is not doing. To increase the value you gain from this experience, go through and develop the application. When you code up the application, do not just cut and paste the code. Type it in, think about what it does, then read the explanations we have provided to describe what is going on. If you still do not understand, then check out the Django documentation, go to stack overflow, search the web until you have filled this gap in your knowledge. Start early – even in the very first year of your college. Just spend a few hours each week. Pick an easy language to learn like Python or Ruby. Learn to program by writing lots of small useful tools, games, apps. Share your programs with others and ask for feedback. Ask them whether they find it useful. Share the code on github (it is free) or other repositories. Post the link on Geek forums and request feedback too (but please don’t spam the groups). Put your github link in your profile, email signature and on your resume. Don’t get upset if people criticize it. All feedback is good when you are learning. Don’t take it personally. If some one cares enough to look at it and give you comments, that is a good thing. Once in a while, take all the stuff you have written, factor out common code and create libraries/modules that you can reuse. Go back and change the programs to reuse these libraries. Repeat 2-6 as many times as you can, every week, every month. Look at some cool open source projects and join in. Contribute in a small way. Keep exploring. When you attend tech interviews, tell them about the stuff you have written. Point them to the links. Share the feedback your received and your journey of learning and iterating. Don’t worry that if you train in programming language X but the job is for Y that you may not qualify. Except in a few cases, companies are trying to hire smart people with lots of initiative, who are willing to constantly learn and explore. It may be a good idea to earn while you learn. It is not just the money, but it is the feeling that someone values what you have done enough to pay for it. Find a master programmer to work with. How do you know they are masters? Pretty simple. Take a piece of code they have written and read it. It will read like an essay – elegant, beautiful and clear. A couple of years of apprentice with such great programmers will do more to accelerate your learning than any other activity. Just learning the standard languages they teach you in your institution is not enough. Practice and feel the joy of programming. You will know whether you like it or not. If you enjoy it, it will show, when you talk to people about it. Most of my reading material comes from following some of the most informed people around me. I love the way that Twitter points me to interesting stuff and causes me to Google, think about and research things that I might otherwise have not. I read things that resonate with me and I am almost compelled to follow them up. the Law of Requisite Variety. This is a law described by cybernetician Ross Ashby which perfectly describes the creative entrepreneur. Basically, the law says that in any system (company, department, a meeting) all things being equal, the individual with the widest range of responses (the most ideas) will control the system. To me this means that the gift or trick is in promoting plenty of ideas, fast and furiously. Attribute #94 from A Complete List of 100 Attributes of People Who Start Companies:How You Can Be One of America’s Entrepreneurs. We tried an experiment with one of our customers and here is what happened. I asked all the participants (there were about 14 excluding me) to take 15 minutes and write down as many ideas as they can, for incremental improvement of their product. At the end of 15 minutes, we had contributions from every one (the lowest number was 6 and the highest was 68). We asked each person to read out one idea. We wrote the idea on a white board and asked others to come up with derivative ideas. By the time we went through 14 ideas (one from each participant) we had more than 100 ideas. I was just moderating and found that every one was totally engaged. It gave us some very good starting points. The process is quantity first, then quality. Lots of people can sift and sort ideas, criticizing and developing. Your job is to get the most ideas on the table, from you or others. A series of events led to this post. First, I finished reading the book on Growth Hacker Marketing by Ryan Holiday . I decided to try a few growth hacks for our products. The first few were to dig a bit deeper and collect more information understand concepts better and start on some small projects related to an initial analysis of my company’s customers. While the book is a great intro to Growth Hacking, Ryan stresses that it is not a set of tools but a ‘mindset’. My second step was to watch this video from Paul Willard on Growth Hacking . Paul talks about lots of experiments he tried, and shares many observations. He talked a lot about Lifetime Value of customers (LTV), the importance of modeling it for future value. I had a rough idea about LTV, but wanted to learn more. You can find the slides Paul used here. I stumbled upon Jason Cohen‘s article – Why I don’t like LTV metric . Here I was, all convinced about Paul’s ideas about LTV, and the very next day I am reading an article that says it is a wrong metric. Jason says that if you make your marketing spend decisions based on a wrong model of LTV, you will be wasting money but explains in another article a revised calculation of LTV. I think I have enough stuff to get started with a few experiments on my own.